Earlier this summer the hinges and clasps on the plastic dado blade box finally broke off. Not too bad for 10+ years of use. About the same time, I was reorganizing shop storage and wound up without a home for the saw blades. There were a couple of boards of American Chestnut that I had been holding back for a special project. I also had seen several blade boxes posted on LJ with some clever ideas which I’ve shamelessly “borrowed”. I also decided that the box I was making for the Leigh mortise and tenon parts wan’t working so I cut the inlay panels off and threw the rest of it away. Sometimes projects can’t be saved. The picture looks better than the box actually looks. What better time to make a couple of storage boxes for saw blades? The dado blade box is 7/8” thick chestnut, 12-3/4” square by 4-1/2” tall. I used the Leigh dovetail jig to make the 5/16” box joints. Rather than having a lift lid, I decided a slide lid would be more functional. 1/2” slots were cut into the sides, and the ends were shortened to accommodate sliding the lid on/off. One of the inlays was laminated to a piece of chestnut and planed to 7/8”. 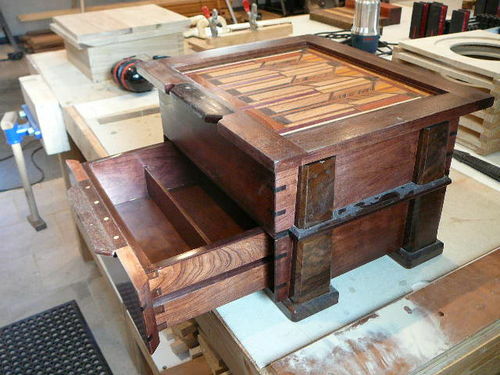 A dado was used to make the rabbet for the sides of the lid to fit the slots in the side of the box. The bottom is cottonwood, with inset rings for the blades and spacers. The small circle jig and router made quick work of both circles. The centers from the blade holders were planed to 1/8” and 5/8” holes were added. A couple of 5/8” dowels provided the spindles for the blades and spacers. The blade cases are made from cottonwood, planed to 1/2” with a 1/4” inset circle routered into the piece. 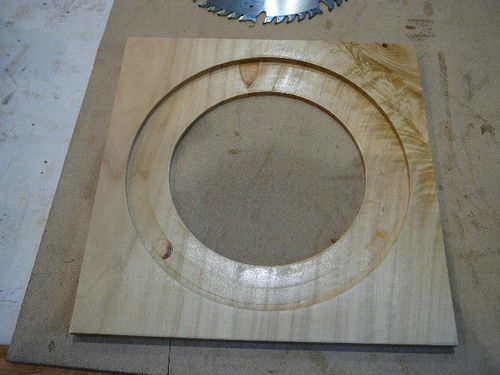 An 8” diameter circle was cut out to provide the spacers for the dado blades as well as providing an easy access for removing the blades from the sleeves. Side note – there are plastic blade sleeves out there as well as a plan to make a blade box using them. The front box joints were “completed” using scrap wood as the “front panel” and flush cutting the “front” piece at the joint, leaving a box joint. The slots for the blade sleeves were lined up with the box joints, making sure that the cuts lined up with the short side fingers so the slots wouldn’t show up in the back corner joints. Since the top doesn’t need to open, the 1/2” thick inlay panel is glued in place and pinned to the sides with Miller Dowels. They were supposed to be cherry but look suspiciously like oak. Everything was sanded to 220 grit, sealed with a coat of Seal-A-Cell, lightly sanded with 600 grit, then topped with 2 coats of hand wiped Arm_R-Seal and final sanded with 2000 grit, and finally waxed with Behlen’s Deluxing Compound (this is my standard finish). Now I need to build a shelf to put these beauties on. Nicely done, Earl. Way to class up the shop! That is some seriously fancy blade storage! 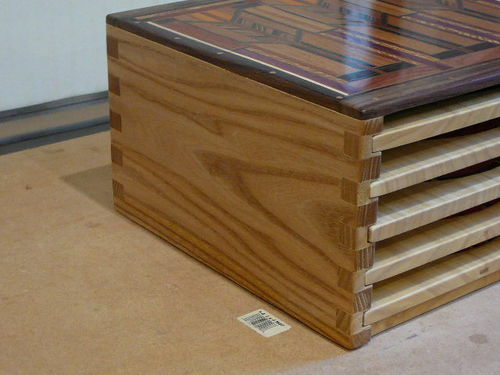 Absolutely beautiful work on those very useful boxes. Keep ‘em waxed and lookin’ spiffy! Geeze Earl! That’s just stupid awesome! Those are both fantastic boxes. That inlay top is superb. That is one beautiful storage box. Should Be in a museum. i dont think ive ever seen a nicer way to store saw blades,beautiful box. Great looking and cool designing. Good job !!!!! You don’t do anything halfway, that’s for sure! I thought it was a repeat of your project from the Box Swap but then realized the design was more angular! Beautiful job once again! What a beautiful way to store blades! There’s no reason something for the shop can’t look nice. I’m awed by your classy approach to your projects, even shop items!